Spring has sprung and I’ve started dreaming about warmer weather gatherings on my deck with friends and family. I love getting together with people for a simple barbeque where everyone can contribute something to the meal. It makes things easier on the host, for one thing, and also means that everyone gets to try all the yummy side dishes and salads that everyone else has brought to share. This is a versatile side dish that can be served warm, at room temperature, or even cold! 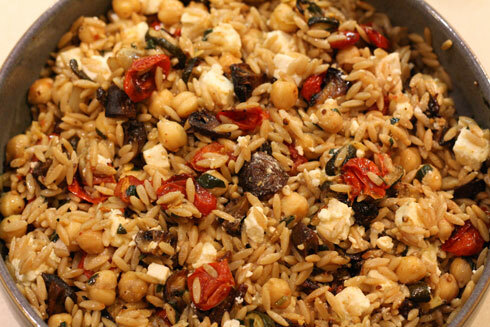 You can swap the spelt orzo for quinoa, millet, or another whole grain alternative, and with the addition of chickpeas it also makes a satisfying vegetarian meal. As the weather warms up and the selection of seasonal produce becomes more varied don’t hesitate to switch up the veggies you use and get creative! This simple dish is chock full of valuable nutrients! 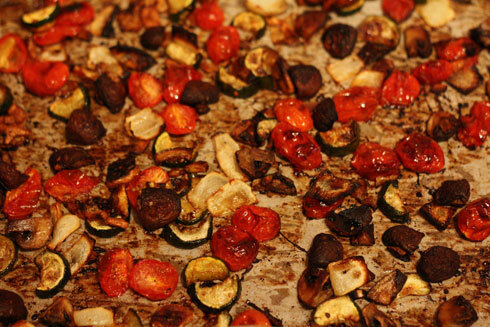 Roasting the tomatoes makes the lycopene (a phytochemical and carotenoid) more bioavailable to the body for use. The onions and garlic contain healthy sulfur compounds vital to a healthy liver and immune system, and the chickpeas contain fibre and protein, as does the whole grain being used. Step 1 – Preheat your oven to 400 degrees. Put your water on to boil to cook your grain of choice. Step 2 – Dump all of your chopped veggies into a large bowl and toss with the 2 tbsp of oil, a pinch of sea salt and some fresh ground pepper. When well coated with oil, dump onto two baking sheets lined with parchment paper (you’ll need two baking sheets to make sure that you don’t crowd the veggies. If they don’t have space between them they will steam, not roast!). Spread out evenly on the sheets. Step 3 – Put your baking sheets into your preheated oven, and if your water is boiling cook your grain of choice according to package directions. Step 4 – After around 10 minutes, check your veg and if it’s starting to brown then stir it around and flip things over. Cook for another 10 minutes or so, or until veggies are brown and roasted to your liking. Step 5 – Once your grain is cooked, drain it, put it in a large bowl and then scrape the contents of your roasted veggies over top. Be sure you get all the flavourful juices in there too! Add your chickpeas and fresh basil and then pour your dressing on top. Mix well. Top with crumbled goat cheese and serve. Serve this dish as a part of a vegetarian weeknight meal or pack it up and take it to your next pot luck. It’s sure to please!